"Unusually clever, really funny and emotionally stirring. Highly recommended!" The Columbia Review. This intricate story, which is categorized by its creators as a “Graphic Epic Poem,” combines prose and illustrations to seamlessly deliver a truly touching tale of adventure, suspense and humor. 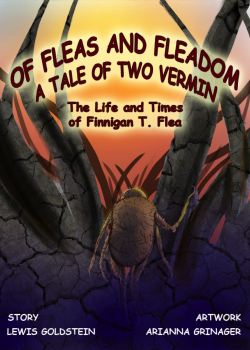 Exploring humanlike notions of quality of life and disruption, personal security and risk, skin-of-your-teeth survival and disaster, intimate love and faith, it tells the story of Finnigan T. Flea as he travels through a life filled with all of the above—and more. The title of Chapter Four defines it best: “Paradise Gained, Paradise Lost.” And then gained and lost again. And again. Telling a story from the point of view of an animal is not a novel concept, but doing it well is a great achievement. Besides, featuring a flea (in an epic story, no less) is truly creative—and often uproaringly funny. Moreover, reaching for an authentic voice is a high bar, which this unique book achieves with flying colors. The story is told in prose arranged like a string of poems, intertwined with magnificent illustrations that compound the drama. In fact, the harrowing events are communicated to the reader with a lively mix of words and images that merge to communicate as one. The story is nicely divided into scenes and chapters, its poetic stride accomplished without diminishing from the steady pace of narrative suspense and the characters’ emotional highs and lows. In essence, the hero wonders about the mother of all existential questions: “As he settled on his new found hide, he wondered about freedom, about how to decide what that really was for a flea.” And, as each of us, human readers, leap from rock to rock down the treacherous river of our own life, don’t we often ask the same question? To sum it all up, this original, creative work is unusually clever, really funny and emotionally stirring. Highly recommended!